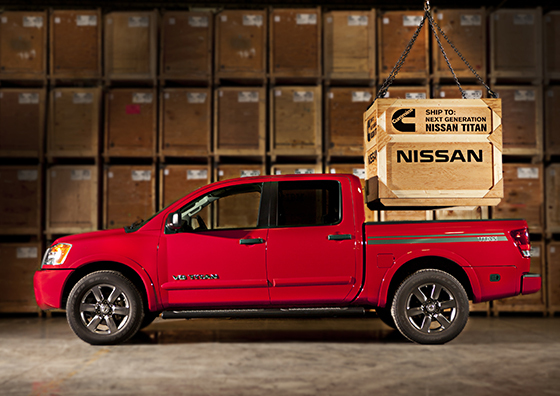 It's official: Nissan Vice President of Sales and Marketing Fred Diaz announced that the new relationship with Cummins Inc. will begin with the next-generation Nissan Titan full-size half-ton pickup truck. Nissan has not announced whether that will be a 2015 or 2016 model, but it's good to hear news like this because it implies Nissan is serious about significantly improving the worst-selling half-ton in the U.S. marketplace. Last edited by psp4ever; 08-20-2013 at 05:42 PM. Last edited by tofunater; 08-21-2013 at 06:45 AM. Wife's been looking at the Titan herself. Might just have to pick up 2. I figured they would sell them in 2-packs like the Kia Rio. Looks like they will try hard to fix the turd. Wow. I think for the first time in about a decade I might be slightly excited about a truck coming out. No offense, but I'll be a bit happy when Dodge isn't everywhere. I have family who only buy Dodges...they're sort of idiots anyway, so doesn't help Dodge's case for me. Oh lookie...oh wait I don't care. It's just like dodge, the best thing they can do is not design/build their own parts. I love the new 8 speed transmission too...since its not dodge tech.